State Capitol -- Thank you Superintendent Barresi, Board members and guests. 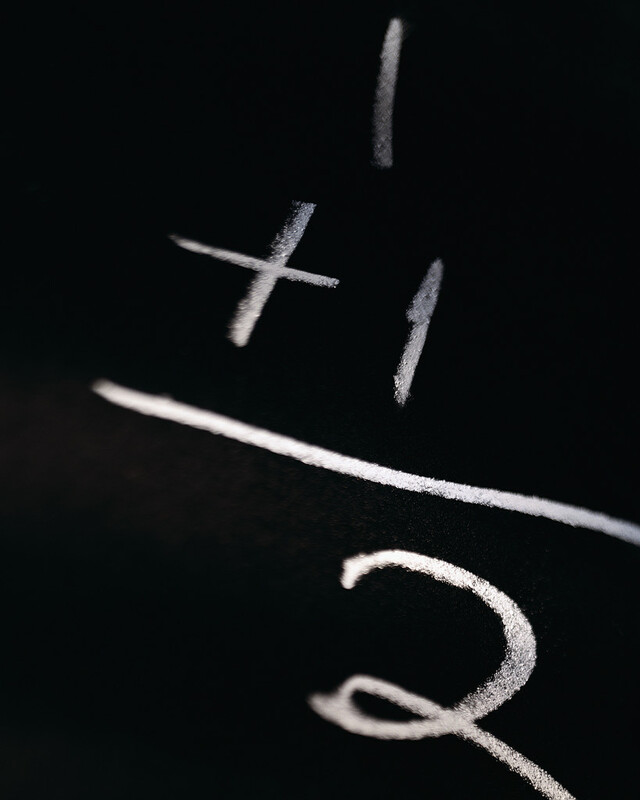 That there is a disconnect between public school administrators and legislators about school funding isn’t news to anyone -- but there’s hope for a solution. The disconnect is caused by a lack of detailed information available to lawmakers during the legislative budget process each year. I’ll share a few observations with you this morning. As I’ve studied mounds of school financial data, many local school officials have cautioned me that the data might not be accurate because some school districts don’t always do a consistent job when reporting data. I have found instances of this. Questions about carry-over funds have been around for years, and have been answered by generalized explanations that fail to account for the large number of diverse school districts. For instance, districts do not receive state aid for the first month of the fiscal year and must use carry-over to pay bills during this time. But this does not begin to explain carry-over balances currently held by schools. I’ll use Luther and Talihina Schools for an example -- two districts with very similar student enrollment, revenue, expenses and carry-over fund balances. Districts don’t begin to receive the bulk of their local funding until January -- six months into the fiscal year. Luther receives nearly 70 percent of its revenue from local sources compared to Talihina at only 10 percent. But both districts carry-over is virtually the same when it would appear that their cash flow needs are very different. We currently have a one-size-fits-all set of rules on carryover funds but no two school districts cash flow needs are the same. Through the funding formula, I can see relatively detailed information about the revenue each district generates for operations. I'm not able to see a corresponding level of detail about how that money is spent. For example, the formula provides a weight or multiplier of .25 for each economically-disadvantaged student to cover additional support costs. Districts cite the increased number of economically-disadvantaged students when requesting additional funds, but I can’t see what districts’ actual costs are for these students. What is the level of disconnect between the funding formula weights for these kids and what school districts actually spend educating them? The formula also creates a disparity between school districts with increasing and decreasing student enrollment. School districts with declining enrollment can count their highest enrollment year for full funding for two years. But increased funding lags six months or more in school districts with increasing enrollment. The formula does not shift money to meet this need in a timely manner. House Bill 1017 is more than 20 years old. The funding formula was passed more than 30 years ago. There are scores of separate funding streams for schools. Each of these laws is based on education staffing models, student demographics and economic factors that have changed significantly in the past 20 to 30 years. It is time to take a fresh look at these issues and to provide the legislature and the public with the information it needs and deserves. This will help ensure that students get the maximum benefit from every education dollar spent. Oklahoma City -- The National Federation of Independent Business, Oklahoma’s leading small business Association, recently announced its endorsement of my bid for reelection to the Oklahoma House of Representatives. NFIB’s endorsement brings with it the powerful support of thousands of small business owners across the state. “Our members, the independent business owners, know and appreciate the importance of an ally in legislature,” said Shouse. This endorsement comes from the Oklahoma SAFE (Save America’s Free Enterprise) Trust, NFIB’s political action committee. The National Federation of Independent Business bases its political support on candidates’ positions and records on key small business issues. My wife and I have parents who started and continue to run successful small businesses. Lori and I also have a small business. Small, independent businesses are the backbone of our economy. As a State Representative I believe small business should be protected from high taxes and burdensome regulations. I will continue to be a champion of our state's main economic engine - small, independent businesses that provide the bulk of the jobs in our state. I'm honored to have the endorsement of the NFIB - a well respected champion of small business. Governor Mary Fallin released the following statement praising the A-F report cards released today by the State Board of Education. The report cards assign letter grades to Oklahoma public schools. “As governor, one of my top priorities is to improve the quality of education for students in Oklahoma. 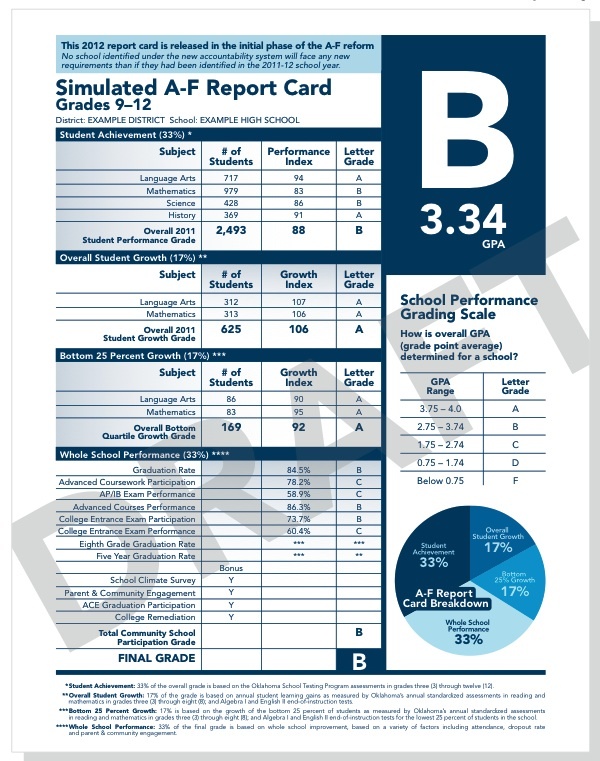 Creating an A-F grading system for schools is an essential step in pursuing that goal. Having this new system will allow us to measure progress, recognize and reward schools that perform well, and identify those schools that are in need of improvement. OKLAHOMA CITY (Oct. 8, 2012) – Oklahoma State Board of Education members on Thursday approved a $289 million Fiscal Year 2014 budget increase request for public schools to be made to the State Legislature late this year as lawmakers prepare for the 2013 Legislative Session. The budget includes dollars for statewide implementation of reforms, as well as funds for teachers and school personnel. "This request represents a substantial increase," State Superintendent Janet Barresi said, "but we will be be basing the increase in funds on performance. We're promising a return on investment to Oklahoma taxpayers." Barresi said funds for schools will be tied to detailed performance metrics in areas such as gains in core subjects such as reading and math, results of a statewide Teacher and Leader Effectiveness system, and gains in closing the state's achievement gaps for minority students. Additionally, with an increase in state aid to public schools, the state would anticipate that local superintendents would use a portion of the new dollars to boost teacher salaries. While the manner and method of teacher pay increases would be left to local decision making, Barresi said it was essential that budget talks this year include an emphasis on better teacher pay. "The increased funds we're asking for focus on better pay for teachers and on results in our schools. It's time for a new conversation about our state's education spending that focuses on targeted strategies and clear-cut results," Barresi said. Barresi said the new budget request would also be tied directly to the state's C3 Plan to have all students graduating from an Oklahoma high school ready for college, career and citizenship by the year 2020. The C3 Plan has seven primary goals: an effective teacher in every classroom, and an effective leader in every school; an increase in the number of students in the STEM (science, technology, engineering and math) pipeline; and stair step readiness goals in kindergarten, fourth grade, sixth grade, high school and upon graduation. Board members reviewed preliminary numbers in a special meeting Oct. 8 and voted to approve the budget Thursday. The budget includes a $234 million increase in state aid to public schools — from about $1.8 billion in FY 2013 to a possible increase of more than $2 billion. The budget request also asks for nearly $46 million more in the state's public school activities fund — targeting key areas for reform implementation such as third grade reading readiness, Advanced Placement teacher training, ACE (Achieving Classroom Excellence) end-of-instruction requirements remediation, additional money for the state's new Teacher and Leader Effectiveness System, and funds for the state's student information system to provide more precise information for teachers in the classroom. The budget increase also will go toward a competitive grants pool for schools to spur innovations and reforms throughout the state. 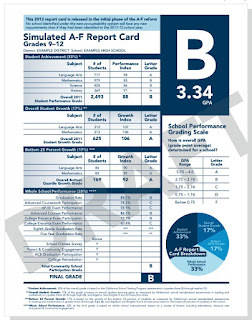 OKLAHOMA CITY (Oct. 25, 2012) – The Oklahoma State Department of Education on Thursday launched the historic release of first-time A-F School Report Cards, giving all schools in the state a grade of A, B, C, D or F – similar to grades given to students. More than 90 percent of schools across the state received a grade of C or higher, with nearly 50 percent receiving a B. Grades are immediately available to the public for online viewing or download on the State Department of Education’s website. The report cards released Thursday represented 1 percent of schools with a grade of an F, 8 percent a D, 34 percent C, 48 percent B, 9 percent A. The report cards show student achievement based on tests scores in subjects such as reading, writing and math. They show overall student growth, and whole school improvement, which consists of such things as student attendance, dropout rates, and advanced coursework. Schools earned bonus points for parent and community participation and for school climate surveys. The report cards originally were planned for release on Oct. 8, but the State Board of Education delayed the vote to take into consideration concerns voiced by a number of state school superintendents. The board on Thursday said those concerns had been thoroughly considered. As part of this new reform, State Superintendent Janet Barresi also has launched Raise the Grade Together — an effort to help every school in the state improve and succeed. Supt. Barresi will visit communities for Raise the Grade Together events, to bring together parents, civic, business and school leaders for constructive conversations about academic success. The effort calls every stakeholder to raise the grade together by taking the mission of educating children as a community approach. Where weak areas in student achievement or attendance are exposed, parents and community members are asked to help schools by offering mentoring assistance or volunteering. Raise the Grade Together began with a symposium for a variety of school leaders in September, along with the release of a resource guide, which can be downloaded by the public on the State Department of Education’s website. If ever there is a season that demands more than 100% of a person’s fortitude and stamina, it’s those six weeks between mid-November and the end of the year. What’s a single mom to do? Attend Jingle Jangle! Jingle Jangle is a Friday night of fun and encouragement for single moms and their children. This event is geared toward women raising children alone. Attendees range from divorced, never married, widowed, separated from spouse, grandmothers raising grandchildren, etc. Regardless of how long you’ve been a single mother or the age of your children, this special pre-holiday night out is for you! The event will feature Pam Kanaly and an interview with Wanda Pratt, mother of OKC Thunder’s Kevin Durant. Pam Kanaly is an author, national speaker and nominee for Oklahoma Mother of the Year 2010. Wanda Pratt is the mother of NBA star Kevin Durant. She gave birth to Kevin before she married Kevin's father Wayne Pratt. This led to Kevin taking his mother's maiden name as his last name. Wayne would eventually leave Wanda, Kevin and Kevin's brother Tony before Kevin's first birthday leaving all the heavy lifting of raising two boys to Wanda. When Kevin turned 9 Wanda introduced him to Taras Brown, the man who would become Kevin's mentor and train him throughout his youth. With Wanda's discipline at home and Taras' training in the gym Kevin turned into the NBA star we see now. Eventually Wayne would come back into Kevin's life but Wanda always gets the credit for raising Kevin from Kevin himself. When the NBA finals get started don't be surprised if you see Wanda dancing up a storm in OKC which always draws a smile from her son Kevin. Jingle Jangle is billed as a time for single mothers to connect with other single moms. This event is free but registration is required. Registration will close after Friday, November 9, 2012. Childcare is provided for children ages birth through 12 years old. Registration is required by Friday, November 9, 2012. Please feed your children dinner before arriving. Children are not permitted in the auditorium during the event in order to allow moms to have a quiet break. 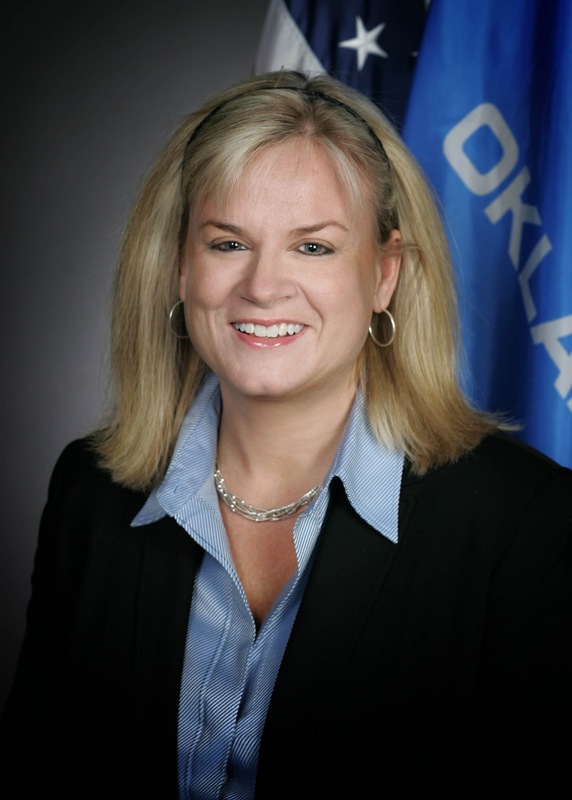 OKLAHOMA CITY – State Rep. Leslie Osborn said conservative policy should include fair compensation for a quality state employee workforce. Oklahoma Secretary of Finance and Revenue Preston Doerflinger said he opposes across-the-board pay increases and longevity-based pay, but supports an appropriate level of compensation based on performance appraisals, and believes it is necessary to recruit high performers. Doerflinger said lawmakers should strive to pay state employees 75-85 percent of the private sector market value of their position to be competitive. The State has consistently lost ground on competitive compensation, according to Lucinda Meltabarger, state administrator of human capital management. As of fiscal year 2011, classified state employees are paid about 19.17 percent below market value. Meltabarger said not all positions are paid equally in relation to the market. For example, IT professionals are paid about $20,000 more at certain local oil companies than at the state, she said. An ideal turnover rate might be about 5 percent, Meltabarger said. According to Ron Wilson, state director of talent management, the fiscal year 2011 voluntary turnover rate for classified state employees was approximately 10 percent. The state loses $68 million annually due to turnover, he said. Meltabarger recommended a more thorough study of state benefits to get a sense of their true value to potential employees rather than their cost to the state. Oklahoma Department of Transportation Deputy Director and Chief Financial Officer Mike Patterson said it is difficult to recruit for the agency’s positions requiring the highest level of training or education. Highly trained agency employees are generally paid between 25-40 percent below the market value of their positions. Oklahoma Treasurer Ken Miller said his office has trouble recruiting employees. He said as conservative lawmakers continue to reduce the size of state government, some of the savings should be used to recruit quality employees. Jonathan Small, policy analyst for the Oklahoma Council of Public Affairs, said the state’s retirement system is outdated and encourages early retirement. Small recommended that the state move to a defined contribution plan for all new state employees. Another factor that affects turnover is employment security, especially with unclassified positions. Small recommended statutory changes that would increase the flexibility agency heads have to provide compensation on a per job, per employee basis; allow for one-time bonuses; modernize the state benefit structure; and remove onerous barriers to compensation systems based on performance. Small specifically highlighted the need for competitive pay and benefits for corrections employees. OPEA Executive Director Sterling Zearley noted that entry-level child welfare specialists are paid on average at 23 percent below the market and that corrections officers begin at $11.83 per hour while an oil field worker is generally paid $25 per hour. Zearley said he believes state employee pay should be 90 percent of market value, partially because benefits have been gradually reduced. He said he agrees with proposals to modernize benefits and move towards a performance-based system. OKLAHOMA CITY – Passage of State Question 762 is a major component of Oklahoma’s effort to build a more efficient government with a stronger criminal justice system, the authors of the ballot measure said Wednesday. SQ 762 would remove the governor from the parole process for nonviolent offenders so that the governor can focus solely on parole matters for violent crimes. Voter approval of the measure would end Oklahoma’s distinction as the only state requiring gubernatorial review of all nonviolent paroles. House Bill 2131, signed by Gov. Mary Fallin in May 2011, contained a provision removing the governor from the parole process for nonviolent offenders. A subsequent attorney general’s opinion determined a state question would be necessary in order to make that reform, leading to the placement of State Question 762 on this year’s ballot via Senate Joint Resolution 25. 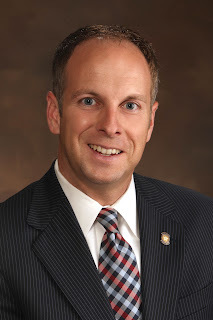 SJR 25, authored by Sen. Josh Brecheen, R-Coalgate, and House Speaker Kris Steele, R-Shawnee, won overwhelming bipartisan support during the 2012 legislative session, passing the Senate 39-1 and the House 86-8. It received more yes votes than the other five resolutions the Legislature approved for placement as state questions on this year’s ballot, making it the most heavily-supported ballot measure of the 53rd Legislature. "As governor, I have been entrusted by the citizens of Oklahoma to serve as a safeguard in the pardon and parole process. I remain supportive of the general concept of removing the governor from the pardon and parole process in order to streamline the procedure for criminals with no history of violence. However, recent events have led me to believe now is not the right time for the governor’s office to be removed from its oversight role of the Pardon and Parole Board. "It appears State Question 762 would define non-violent offenders only by their current offense and would not mandate the consideration of past violent behavior. Since taking office, I have denied parole for 437 offenders, who would be considered ‘non-violent’ under the terms of State Question 762, keeping them off our streets and out of our communities. "In the interest of public safety and the well being of Oklahoma, the governor’s office should continue to provide this oversight until additional reforms and changes can be made at the Pardon and Parole Board. Therefore, I do not support State Question 762. My office will continue to work with the Pardon and Parole Board, the legislature and the legal and law enforcement communities to pursue reforms that will deliver efficiencies while protecting public safety." Oklahoma Capitol -- The Oklahoma State Department of Education is in the process of developing certification for instructors of Native American Languages in Oklahoma public schools. A committee will be formed to review past certification in our state, investigate similar certification in other states, and work to develop the new certification standards in collaboration with Oklahoma’s Tribes. All interested parties wishing to be part of the committee may complete an application by October 17, 2012, to apply. Download an application form here. 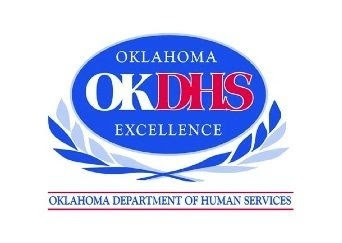 OKLAHOMA CITY – Governor Mary Fallin today applauded the selection of Edward Lake as the new director of the Oklahoma Department of Human Services (DHS). The DHS Commission announced Lake’s selection at a board meeting on Wednesday. “I applaud the selection of Edward Lake as the next director of the Oklahoma Department of Human Services,” Fallin said. “With experience at nearly every level of the Tennessee Department of Human Services, Ed understands the challenges of managing an agency that interacts with the public at many levels. He has proven himself an effective leader who was able to work with the agency and external stakeholder to improve the quality of services delivered to clients. 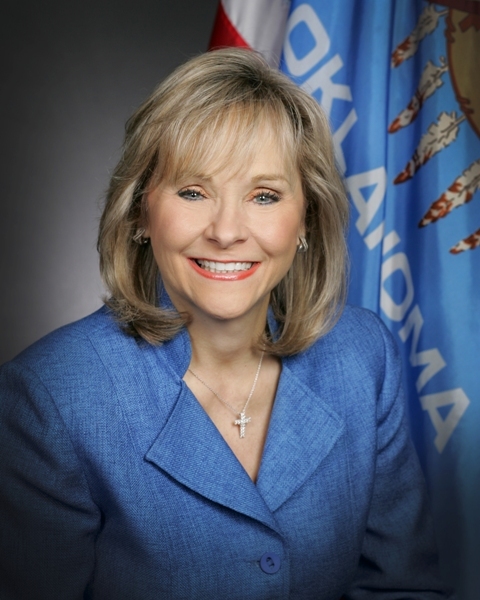 Governor Fallin met in person on Wednesday with Lake. The governor said if State Question 765 is approved by voters in November, she has no plans to replace Lake as DHS director. Governor Fallin thanked Secretary of Finance Preston Doerflinger, who had served as interim director of DHS since March. 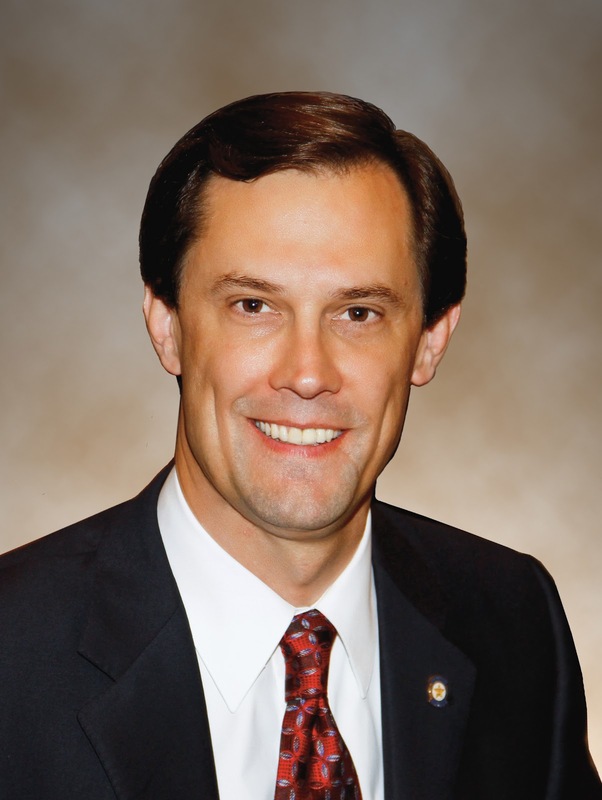 Doerflinger will resume his duties as director of the Office of State Finance. Edward Lake, from Hendersonville, Tenn., has experience working at almost every level of the Tennessee DHS from 1973 until retiring in 2011. He served as a child welfare caseworker, a food stamp office supervisor, and as both a county and regional director in social services. He served as deputy commissioner of the agency from 1992 until 1996, as assistant commissioner from 1996 through 2003 when he was again named as deputy commissioner until his retirement in 2011. Responsible for the day-to-day operations of TDHS, Lake managed the department’s more than 5,000 employees in all 95 counties of the state. The state agency administered programs including Supplemental Nutritional Assistance Programs (SNAP); Temporary Assistance to Needy Families (TANF); Medicaid; adult protective services; child care licensing; vocational rehabilitation, disability determination services; child support; appeals and hearings; as well as several federal community services programs. Lake has extensive experience with organizational change and oversaw comprehensive restructuring of the agency. He worked to improve client services and build external support of the department’s efforts by working closely with advisory groups of advocates, legal aid staff, and other key external stakeholder groups. During Lake’s tenure at TDHS, he was among key contributors to the development of the agency’s child welfare caseworker training academy and received a community service agency award for improving the department’s and the community’s child abuse services following a nationally publicized child abuse death. 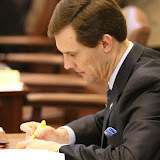 He also provided leadership for the design and implementation of sweeping child care licensing reforms in state statute and policy, including a statewide rated child care licensing system. Lake led the department’s implementation of the first TANF program and chaired the Governor’s Task Force on Families First (TANF program) to develop comprehensive changes to the program. He provided leadership during the state’s emergency responses to Hurricane Katrina and developed an innovative method for providing immediate financial assistance to relocating victims through the use of “pre-loaded” electronic benefits cards. Lake holds a bachelor’s degree in social work from East Tennessee University and a master’s degree in Social Work from the University of North Carolina at Chapel Hill. Oklahoma Capitol—The Human Services Commission voted today to offer Edward Lake the position of Director of the Department of Human Services. The Commission held a special meeting to interview Lake in executive session and afterward voted to offer him the position. Lake's salary will be $185,000 per year along with a one-time $5,000 signing bonus per Merit Protection Commission rules. Lake must accept the offer by 5 p.m. on Oct. 15, 2012. If he accepts, his start date as Director will be Nov. 1, 2012. Lake, a retired deputy commissioner for the Tennessee Department of Human Services (TDHS), indicated to the Commission that he wanted to take some time to consider the offer and discuss it with his family before making a final decision. From Hendersonville, Tenn., Lake has experience working at almost every level of the Tennessee DHS from 1973 until retiring in 2011. He served as a child welfare caseworker, a food stamp office supervisor, and as both a county and regional director in social services. He served as deputy commissioner of TDHS from 1992 until 1996, as assistant commissioner from 1996 through 2003 when he was again named as deputy commissioner until his retirement in 2011. The Commission has been conducting a nationwide search since March to replace former Director Howard Hendrick who retired after serving nearly 14 years in the position. OKLAHOMA CITY (Oct. 8, 2012) – Oklahoma State Board of Education members on Monday reviewed preliminary numbers for a possible $289 million Fiscal Year 2014 budget increase request for public schools to be made to the State Legislature as lawmakers draw closer to the 2013 session. The Board will vote on a budget request at its next regular meeting on October 25. The preliminary numbers board members reviewed Monday include dollars for statewide implementation of reforms, as well as funds for teachers and school personnel. State Supt. Janet Barresi said the new budget request, if approved, would represent a shift toward demonstrating a return on investment to taxpayers by tying state funds for schools to detailed performance metrics in areas such as gains in core subjects such as reading and math, results of a statewide Teacher and Leader Effectiveness system, and gains in closing the state's achievement gaps for minority students. "The increased funds we're asking for focus on better pay for teachers and on results in our schools. It's time for a new conversation about our state's education spending that focuses on targeted strategies and clear-cut results," said Barresi. "While the State Board will likely ask for more dollars, we'll do so within a responsible and productive framework. This budget request represents increases for programs and support for reforms, but we should tie those increases to accountability. In much the same way that our state's transportation department has been able to show real results to taxpayers by improving our roads and bridges infrastructure and investing in hard assets, we need to begin showing an educational end product that demonstrates success." Board members reviewed preliminary numbers that include a $234 million increase in state aid to public schools — from about $1.8 billion in FY 2013 to a possible increase of more than $2 billion. The budget request would also ask for nearly $46 million more in the state's public school activities fund — targeting key areas for reform implementation such as third grade reading readiness, Advanced Placement teacher training, ACE (Achieving Classroom Excellence) end-of-instruction requirements remediation, additional money for the state's new Teacher and Leader Effectiveness System, and funds for the state's student information system to provide more precise information for teachers in the classroom. The budget increase also would go toward a competitive grants pool for schools to spur innovations and reforms throughout the state. 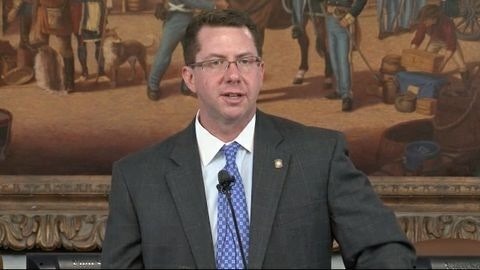 Oklahoma Capitol -- The State Department of Education has postponed the release of A-F Report Cards, and will reschedule the press conference that was initially scheduled for 1:30 p.m. today. The State Board of Education tabled a vote on the acceptance of the report cards until the October 25 full board meeting. Oklahoma Capitol -- A September 30 story in the Sunday Oklahoman regarding employment turnover among public school superintendents revealed just how far the education establishment is willing to go to blame State Superintendent Janet Barresi for even the most innocuous occurrences. According to the Oklahoman, Fort Gibson Public Schools Superintendent Derald Glover blames Superintendent Barresi and recent reforms she has supported for the turnover. Glover’s comments are noteworthy because he is chairman of the Cooperative Council for Oklahoma School Administration (CCOSA), an association of public school superintendents in Oklahoma. Glover acknowledges circumstances at the district level are a factor in superintendent turnover, but he "believes there's a stronger force behind the resignations, retirements and firings." Glover said, "We have a lot of reform being pressed down on us all at once ... I think that's why you're seeing more and more people get out of this profession and fewer and fewer getting in." The Oklahoman reports that between 2006 and 2011 more than 300 superintendents resigned and another 218 retired or were terminated by local school boards. Glover's comments are inane since Barresi was in office for only one of the five years examined in the story. The peak year for resignations was 2008 when 75 superintendents resigned -- well before Barresi was elected. Varnum Public Schools changed superintendents every year between 2006 and 2011 and twice last year. Watson Public Schools changed superintendents five times since 2006, while Holdenville Public Schools replaced its superintendent six times since 2006. Oklahoma City Public Schools has seen four superintendents leave since 2006, including two departures in 2008. As chairman of CCOSA, Glover's comments make it clear they won't let common sense stand in the way of blaming Barresi for even the silliest and most remote grievance. The truth should compel CCOSA leaders to acknowledge that local control, old age and criminal charges have had more to do with superintendent turnover than Barresi. Former Skiatook Superintendent Gary Johnson resigned in 2010 and later pled guilty to bribery charges. Former Broken Arrow Superintendent Jim Sisney was fired in 2008 and was recently indicted on bribery and conspiracy charges. Many superintendents "resign" to avoid being fired, often agreeing to resign in exchange for an agreement by the school board to divert taxpayer money from the classroom to a contract buyout for the superintendent. In addition, many resignations resulted from superintendents moving to more lucrative districts as others retired or were terminated. In a recent discussion about this topic I was told "the cause of the large Superintendent turnover in 2008 was the passage of ESIP in 2006. ESIP was a change in Teachers Retirement that allowed for past service credit salary levels to be increased. This legislation was supported by all the major groups representing school administrators. After passage many administrators used the provisions of this legislation to increase their retirement payments." 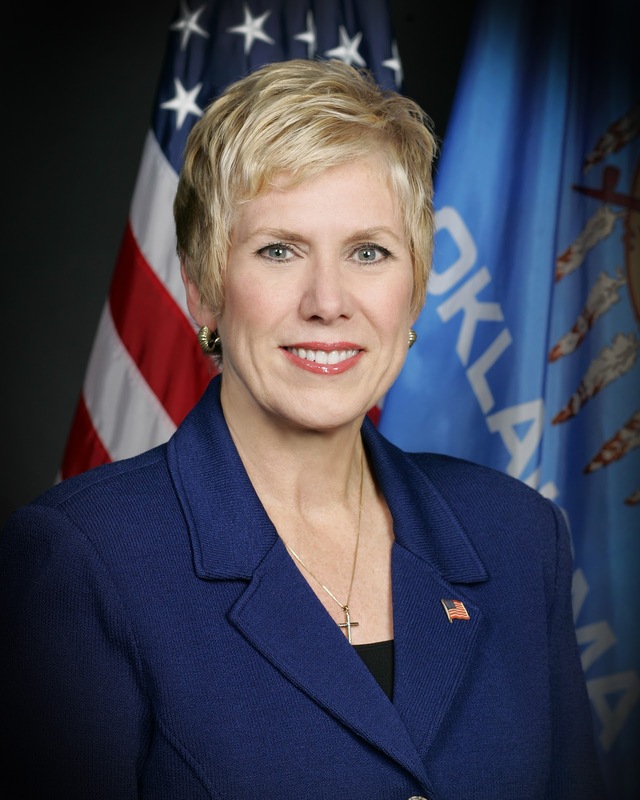 Superintendent Barresi’s election represented a demand by voters for higher expectations and more accountability in public education in Oklahoma. Barresi is not alone in her desire to improve student achievement. Gov. Mary Fallin and legislative leaders have worked hard to pass meaningful education reform laws in recent years. By now it shouldn't surprise anyone that school superintendents are blaming Barresi for something as ridiculous and random as school superintendent turnover. One thing is certain: superintendents aren't leaving because of pay cuts or the elimination of their positions (with rare exceptions). The education establishment has taken their dislike of Barresi to a new low. What: The State Department of Education will publicly release A-F School Report Cards for all Oklahoma schools. The SDE will demonstrate the new A-F School Report Card website, where all school report cards will be visible and available for public download. Who: State Superintendent Janet Barresi, Crutcho School Superintendent Teresa McAfee, Crutcho Principal Robert Killian, State Board of Education members, and others. When: 1:30 p.m., Monday, Oct. 8, 2012. Where: Crutcho Public Schools, 2401 N. Air Depot Blvd. Oklahoma City. OKLAHOMA CITY – In response to Gov. Mary Fallin’s call for a debate about the structure of Oklahoma’s school systems, House Speaker Pro Tempore Jeff Hickman and Ringwood Public Schools Superintendent Dr. Tom Deighan presented an interim study on the issue to the House Common Education Committee last week. Hickman, who requested the study, came away with a number of concerns and ideas. Oklahoma currently has 523 school districts, ranging from urban school districts serving large student bodies from small geographic areas to rural school districts serving smaller student bodies from vast geographic areas. More than 75 percent of Oklahoma school districts have fewer than 1,000 students and more than half have less than 500 students, Deighan told the committee. Those smaller, rural districts are often pointed to as targets for consolidation. “I’m a little bit frustrated that school consolidation always seems to be a rural issue,” Rep. Doug Cox, M.D. (R-Grove), said during last week’s interim study hearing. Hickman said consolidation isn’t as simple as it sounds. If policymakers do decide to restructure school districts, Hickman said they might start by reviewing the 104 dependent school districts that only offer classes through eighth grade before sending students to a neighboring high school while keeping all the property tax money within their district for the K-8 school. Deighan said the average dependent school district only serves 1/7th of the students of independent districts, and only covers 1/3rd of the area. Keeping those sites open but moving them under the umbrella of a neighboring independent district as an elementary or junior high school would leverage purchasing savings and reduce administrative costs. Hickman said that would reduce the number of school districts in Oklahoma by 20 percent without closing the door on a single student. Solely as a means of spurring committee discussion, hypothetical criteria on district consolidation was presented at last week’s interim study hearing. Using that hypothetical criteria of less than 250 students, serving less than 200 square miles, receiving state aid of at least $200,000, and having an average composite ACT score below the state average or unreported, only 32 of Oklahoma’s 523 school districts would be identified for consolidation. As a school superintendent, Deighan said he appreciated recent efforts by some legislators to deregulate districts even though major deregulation legislation has failed to be signed into law. Brandon Dutcher, vice president for policy at the Oklahoma Council of Public Affairs, a conservative think tank, wrote this summer that focusing entirely on consolidation may be missing the goal of giving parents more opportunities for the best education possible for their children. “Indeed, historian Bob Blackburn has a point when he says of consolidation that the idea of giving up control over your school district in your local community is not the conservative way,” wrote Dutcher in August. During last week’s interim study, some Common Education Committee members questioned whether the discussion should be about more school districts in Oklahoma instead of less. “Wouldn’t it make a little more sense rather than looking at some of the smaller schools that spend the least amount of money and do some of the better jobs to look at the two larger districts that do the worst job in terms of education in several areas, and spend the most amount of money, and deconsolidate Oklahoma City and Tulsa schools to make three or four good school systems out of one that continually and perennially causes headaches for the Legislature?” asked Rep. Gus Blackwell (R-Laverne), member of the Common Education Committee. According to an analysis of State Department of Education data by the Organization of Rural Oklahoma Schools, 11 of the top 20 schools with the highest ACT scores in the state are in districts serving less than 500 students. Graduation rates in districts under 500 students are significantly higher than in larger districts – seven percent higher overall and 21 percent higher than the largest districts in the state. Non-instructional costs in Oklahoma’s smallest schools are $266.69 less per pupil than in the largest schools. Maintaining access in all corners of the state while reducing overhead costs is also an issue in higher education. In an interview this summer, former state legislator and Oklahoma Gov. David L. Boren, now president of The University of Oklahoma, was asked if Oklahoma had too many school districts and too many college campuses. Boren said the answer is potentially yes to both. Hickman said education discussions should focus first on quality. 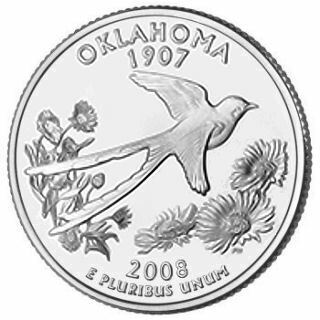 OKLAHOMA CITY – Revenue collections ticked up in September, pushed by strong income tax remittances, State Treasurer Ken Miller announced this week as he released the monthly gross receipts to the treasury report. Total collections were almost three percent higher than in September of last year. Three of the four major tax categories were positive, with income tax leading the way up almost 16 percent. Sales tax and motor vehicle receipts also showed growth. Collections from the gross production tax on oil and natural gas remained well below prior year totals, down almost 40 percent, but off their low of 54 percent below the prior year in August, indicating we may have turned a corner, Miller said. The positive turn on gross receipts comes after collections dropped below the prior year during three of the past seven months, including August. However, oil and natural gas production collections have been consistently lower than the prior year for 10 months. Oklahoma Capitol -- The State Department of Education is launching Raise the Grade Together – an initiative designed to complement the release of Oklahoma’s A-F School Grading System in October 2012. Raise the Grade Together will strengthen communities and school districts with support. The first component of Raise the Grade Together is a Raise the Grade Together resource guide. You can access this guide here. 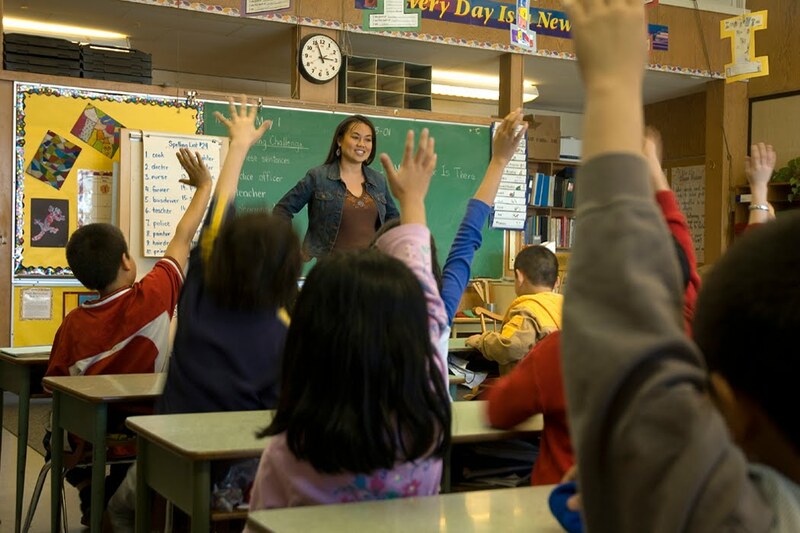 With this Raise the Grade Together resource guide, the Oklahoma State Department of Education has provided a number of tools, tactics and strategies for fostering community conversations and planning within school districts.